Tom Crean was one of the most experienced Antarctic explorers to join the Endurance. He had been south twice with Scott on the Discovery and Terra Nova expeditions where he exhibited exemplary stamina and strength. Crean was awarded the Albert Medal for bravery for a 35 mile marathon across the Great Ice Barrier to get help that saved Teddy Evans in 1912. Tom Crean was known to his crew mates as the “Irish Giant.” Shackleton chose Crean for the open boat journey to South Georgia for his unfailingly cheerful attitude and durability. Crean took a great interest in caring for the dogs on the journey south aboard the Endurance. “Opposite the pigs are five puppies and their mother, the ‘interesting event’ having taken place three days ago, but so far Tom Crean who has cared for her like a hospital orderly is the only one who has seen the little creatures, though we all hear their shrill little squeaks. They will soon be fun”. 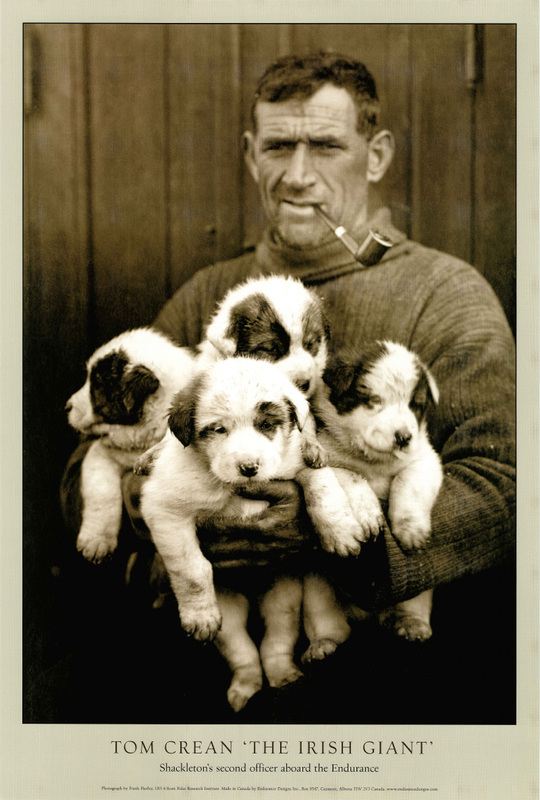 The pups in Crean's arms were born aboard the Endurance January 7, 1915, a product of Sally and Samson. They were named (l-r): Roger, Toby (back), Nell (front) and Nelson. The sled dogs chosen for the expedition came from Canada and were shipped to Buenos Aires where they were picked up by the Endurance. None of them were pure huskies, but mostly of mixed breeds. The dogs became great companions and diversions to the men during the long winter of 1915 with the ship beset in the ice and while they drifted with the pack after the ship sank. It was a sad day when Shackleton ordered the last of them to be put down just prior to launching the lifeboats from “Patience Camp.” The dogs had outlived their usefulness and necessity demanded their demise. The boats were to be so tightly packed with men, food and supplies that there was no room for the dogs.